Sorry again for the very limited posting, I still have a week and a half of surgery left and I’m trying to study for the shelf exam. This was done with China Glaze I’m Not Lion as the base nail polish and Zoya Ibiza stamped with Bundle Monster plate BM-322. Thanks for stopping by! I first realized I was a sucker for tribal prints 3 years ago. I’m surprised the trend hasn’t died out since then. The base polish is China Glaze – I Herd That. The design is done with neon pink and blue, black and white nail art pens. Thanks for visiting! I’m still on a pseudo-hiatus while I’m on my surgery rotation, but here’s Illamasqua Lament with a gold hexagon sequin stripe accent nail. I got the glitter on ebay, it was a great deal! Without a doubt, my favorite way to do a French manicure is with the Konad stamping plate that comes with the French manicure kit (set F, plate M19). It takes some getting use to, but once you do, you can do the tips in just minutes, and they end up a lot more even for me than doing them freehand. 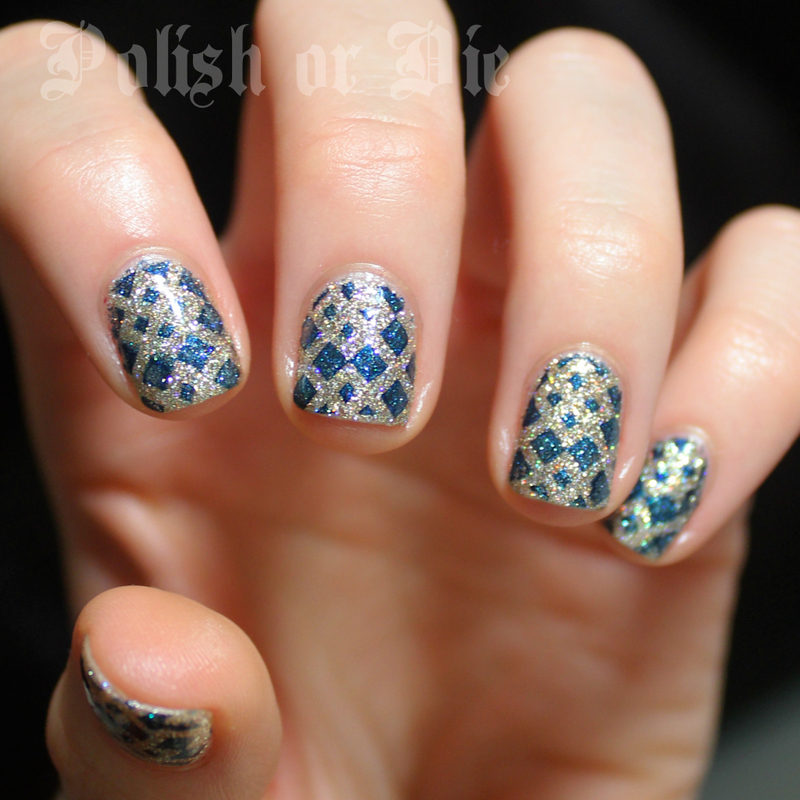 For these, I did the tips with the stamping plate, then put Essie Shine of the Times on top. After a while, I decided I didn’t like the glitter over the white tips so I just restamped them, so the tips are a bit thick. Has anyone tried using this plate? Have you had any trouble? I like the idea of sequins and glitter for the holidays, especially for New Year’s, but I don’t think I could pull off something like a sequin dress. I think this is the next best thing for me. I used mini hexagon glitter that I found on ebay, and I just sprinkled on after applying a similarly colored nail polish. It ended up staying on my nails surprisingly well. I put a top coat on over, and I didn’t have much trouble with it. I’ll probably try to recreate something similar for New Years. 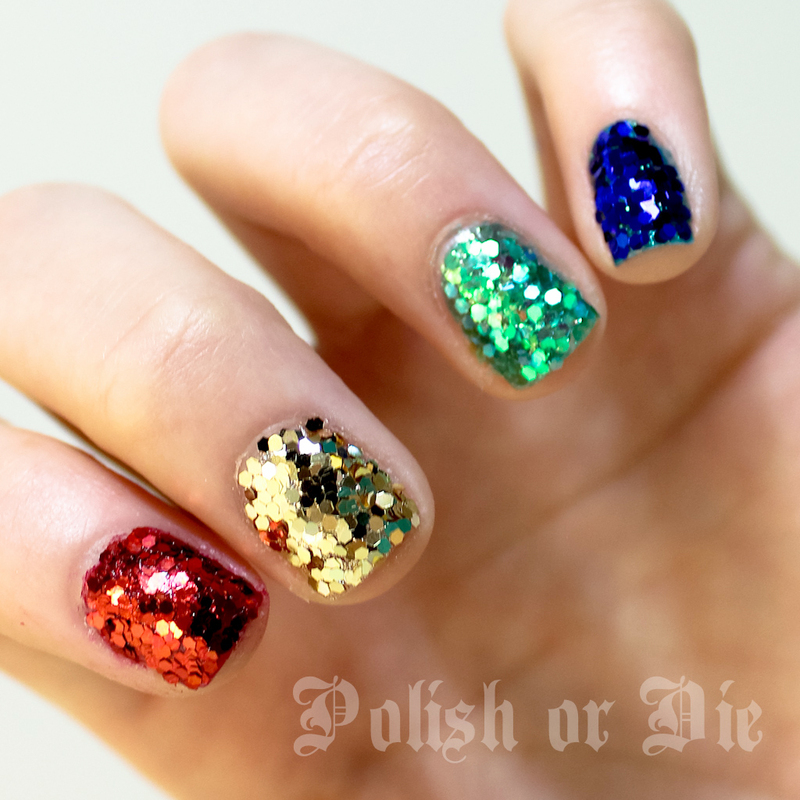 This manicure was inspired by Polish Days over at Polly Polish, with the theme “bling.” Check out some of the other wonderful manicures below. Today’s manicure is done with Christian Dior Sienna and stamped with China Glaze Passion using Bundle Monster BM 312. I was hesitant to get the Dior polish since it’s so expensive, but I convinced myself that if I got something in a conservative shade I could use it for interviews in the future. Maybe not the most sound reasoning, but I really like the formula. It applies like butter and was opaque in two coats. The brush is thicker than that for your average nail polish. I have mixed feelings about thicker brushes. They help with an even application but are less precise. Unexpectedly, I ended up really liking the brush. The accent nail is with China Glaze I’m Not Lion, which I knew I’d love as soon as I saw it. It is a holographic glitter with a coarse texture once it dries. I had some trouble photographing this manicure for some reason, so these pictures don’t do it justice. I picked up China Glaze I Herd That at the same time, which is a similar glitter polish, but is copper. I can’t wait to try that one out now. I’m not doing any black Friday shopping this year. 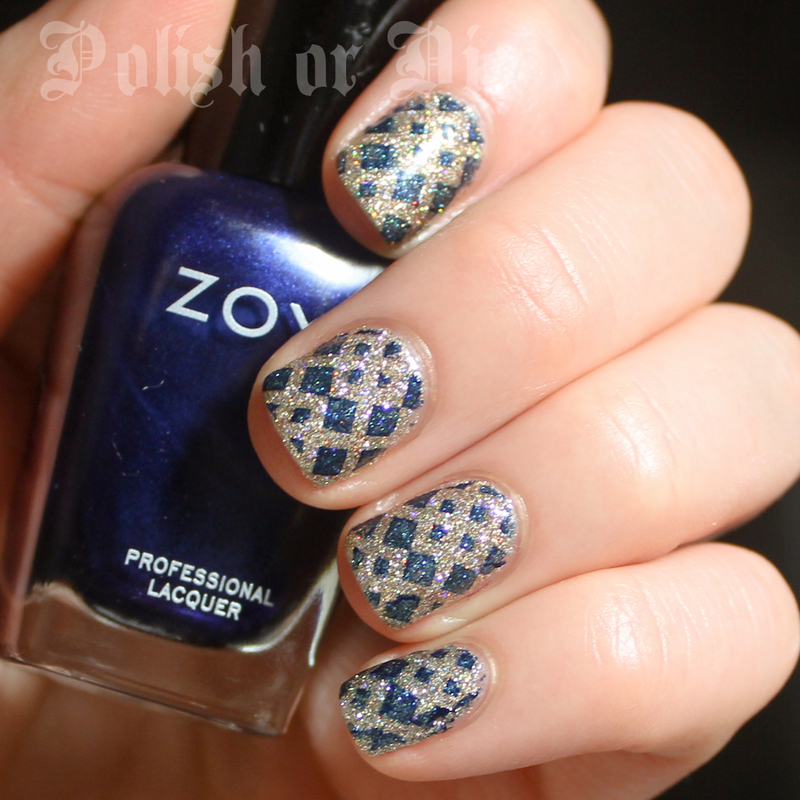 The one thing I’ve been eyeing is at Zoya. My mom is impossible to shop for. The one thing that I know she’ll use if I get it for her is nail polish. For mother’s day, I got her a boxed set from Zoya that they had as a special. It was three pre-chosen colors in a nice black box. I ended up swapping out some of the colors I didn’t think she would like as much. Now, they’re selling the same boxes with your choice of colors, called dream boxes. I know what I’m getting everyone for the holidays now! China Glaze’s Ruby Slippers has a cult following. I got it quite a few years ago when I was searching for a black nail polish with red glitter in it. I intended to mix it with black polish, but I just didn’t get the effect I wanted. I realized shortly after that I love one coat of it over black polish. This is over Zoya’s Raven. What’s your favorite way to dress up black nail polish?